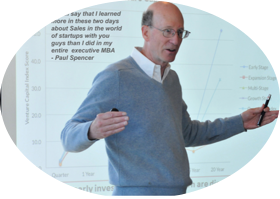 What is the Sales Management Boot Camp? We Increase your Sales Management Productivity by 25% ! Our next event will be Sunday June 16th through to Tuesday, June 18th. We will begin late afternoon at 5:00 PM with a team-based, highly interactive Harvard Business School case study, and we bring it to a close Tuesday early afternoon. Everyone leaves our Sales Management Boot Camps totally stoked to meet the demands of Q2 plus everyone's armed with new ideas, new strategies, new tactics and new skills to put to use in developing their 2019 Sales and Business Plans. ...and...in addition to the intensive two days, we also provide our Campers with these FREE services ! The Pre-Boot Camp Website Assessment which will focus on the clarity of two critical Sales tools we will develop during the Camp - "Command of the Message" and "Value Propositions". The Monthly Team Conference Call held once a month for six months following the Camp, where we will review plans, discuss current hiring and comp issues... anything that you want to bring forward to your fellow Campers to discuss. There will be a set agenda for these calls, and materials will be circulated beforehand in order for you to provide and receive expert feedback from your fellow Campers. The Campers Reception is a work meeting which will be held at a few months after Boot Camp at the University Club of Boston to renew, refresh, present (if you want) and discuss your 2019 Sales Plans. With this engagement, you're guaranteed to leave this Sales Management Boot Camp with new ideas, new strategies, tons of executable tactics along with exciting new productivity tools that you can use immediately giving you both short and mid-term productivity impact on your quotas. Is this Boot Camp for You? Our last Sales Boot Camp was held earlier this year with a select group of approximately 30 senior business and sales leaders. Our Drill Sergeants included Jack, George and John with Campers from a wide variety of industries, markets and sizes. We know from our experience that the diversity at the Camp provides a high degree of impact for all of our Campers. This program is specifically designed for Presidents and CEOs, Sales management at district, regional and national levels, heads of Marketing and heads of Business Development. The Derby Management team, and all of our speakers, have sat in the chairs-just like you-as CEOs, heads of Sales and heads of Marketing of both startups and middle market companies in a wide variety of industries. We’ve successfully coached hundreds of managers through good and the not-so-good times, and, as such, we’ve earned the brand as experts in Sales and Marketing productivity improvement. 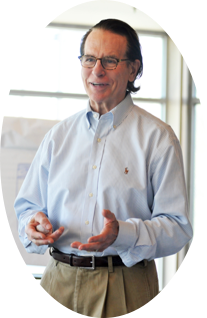 George Simmons has become a highly respected national sales expert in coaching sales management and sales teams in how to understand, interpret and deliver the absolute best Value Propositions and other sales tools. From our own management experiences with thousands of salespeople, we know that delivering effective value props is the #1 sales tool in creating highly efficient sales processes and boosting sales productivity. ...increase your team's productivity by 25+% in 1 year. ...hire & successfully retain A-level people 95% of the time. ...integrate sales processes & tools 100% of the time. The price also includes monthly telephone coaching for 6 months after Camp ! The price also includes our January Campers Reception to deliver your 2019 Plan! Just Want to Sign Up? We find that most people have questions of some sort, so we would encourage you to email Jack directly at jack@derbymanagement.com, or just call him at his cell at 617-504-4222. He can take you through the registration process quickly.